Help Coach Stoops Support the Plunge! 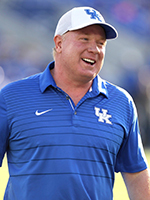 Kentucky Football Coach Mark Stoops is working to support Special Olympics athletes through this year's Polar Plunge. Visit his page to make a donation and help him change the lives of Special Olympics athletes in Kentucky! Are you ready to Get Cold for a G-G-G0-Great Cause? Each year, the Polar Plunge for Special Olympics Kentucky challenges hundreds of brave jumpers to get Freezin for a Reason in support of the over 8,900 children and adults with intellectual disabilities who participate in year-round sports and health programming provided by Special Olympics Kentucky. The Polar Plunge is the most unique fundraiser around. It’s a great way for everyone —individuals, organizations and businesses—to get involved in supporting Special Olympics Athletes. It’s the kind of thrilling event that you really must experience to understand. Since 1997 over 20,000 Plungers have raised over $5 million to support Special Olympics through the Polar Plunge! Be a part of the coolest event of the season in 2019! Plunge, spectate, donate or volunteer - you'll make an everlasting memory this winter season. So, grab some friends, get pumped, register and make a fundraising page today! All funds raised go to support more than 8,900 Special Olympics Athletes in Kentucky and all donations are tax-deductible. For more information about the Polar Plunge, contact Taylor at 502-695-8222 or by e-mail at Tballinger@soky.org. If you have all your money raised you can skip the lines on the day of the event! Come to early registration and pick up your incentives and wristbands for the Plunge and secure your spot in line!